For some women facing unplanned pregnancy, abortion may be the reactionary first choice. For others, circumstances may be so overwhelming they can see no other choice. Despite the abortion industry’s charade to the contrary, many women do regret their abortions, often intensely, sometimes immediately. For women who have surgical abortions, regret is always too late. For women who have taken abortion-inducing drugs, however, reversal may be possible. Such was the case with Becky Buell. Pregnant at 17, she decided abortion was not an option. She bore her son and married his father, and the young family lived with her parents. Becky finished high school early and started college. Less than a year later, Becky was pregnant again. She struggled to weigh the pregnancy against a failing marriage, what her parents would say, the needs of her 11-month-old son and the promising path ahead of her. It was hard to see past the crisis. Abortion seemed to answer every question. Through the first nine weeks of pregnancy, the abortion industry promises an easy way out: take one pill, mifepristone, to make the uterus hostile to new life. Then take a second pill, misoprostol, 24 to 48 hours later to empty the uterus. Overwhelmed, Becky decided to abort her second child. Eight weeks pregnant, she sat down at Planned Parenthood and swallowed mifepristone, or RU 486. She planned to take the second pill the next evening. Still sitting in her parked car, Becky used her cell phone to search for some way to undo what she had done. What she found was the hotline of Culture of Life Family Services. Reversing chemical abortion is the work of George Delgado, MD, founder and medical director of Culture of Life Family Services, a non-profit medical facility with offices in San Diego and Escondido, California. In practice more than 25 years, Dr. Delgado is board certified in both family medicine and hospice and palliative medicine. In addition to family practice, Culture of Life Family Services focuses on women and families facing unplanned pregnancies. 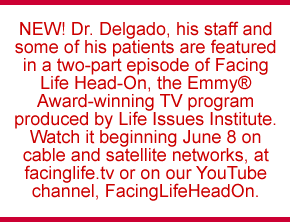 Dr. Delgado and his staff are committed to the sanctity of life and offer a range of free services. Their holistic approach includes not just medical care but also psychological and spiritual counseling. RU 486 blocks the hormone progesterone. Progesterone prepares and maintains the uterus for pregnancy, thickening the lining to nourish the new life implanted there. If progesterone is blocked, the lining breaks down. Misoprostol then cues the uterus to expel the lining, taking the perfectly developing life with it. In short, the abortion industry wants women to believe a chemical abortion is simply medical treatment with almost no repercussions. The industry refuses to acknowledge the damage abortion causes both physically and psychologically. Research has shown that stress has a marked influence on decision-making, affecting perception, compromising competence in judgment and narrowing one’s focus.2 The abortion industry’s fierce opposition to waiting periods, counseling and information about fetal development that would help mitigate stress proves its disregard for women’s wellbeing. Fortunately for Becky Buell and her second son, physicians such as George Delgado do understand the blinding power of stress and the searing pain of regret. Dr. Delgado began to research abortion pill reversal after a young patient asked if he could undo her decision to start a chemical abortion. He knew that pregnant women at risk of miscarriage are treated with doses of progesterone, and he reasoned the same approach might offset RU 486. The patient’s reversal succeeded. He conferred with other doctors who had also had success, and in December 2012, with Mary L. Davenport, MD, he published a report in The Annals of Pharmacotherapy, a peer-reviewed journal. The report, Progesterone Use to Reverse the Effects of Mifepristone, cited four reversals from six cases and suggested a reversal protocol. With success documented, Dr. Delgado set up a hotline and a registry of doctors willing to administer the protocol; so far, 274 doctors in the US and 20 in other countries have joined. He also launched a website, abortionpillreversal.com. To date Culture of Life Family Services has helped women in 45 states and 13 countries. The hotline is answered 24 hours a day, seven days a week. Calls go directly to the cell phones of nurses with Culture of Life Family Services. If a woman calls from an area not served by a registry physician, the staff drops everything to find a doctor willing to help. The woman receives progesterone injections if she can be seen right away. If she can’t, she receives a prescription for prometrium, a vaginal suppository that is nearly as effective. The injections continue throughout the first trimester, decreasing in frequency. Periodic ultrasounds confirm continued viability. Ideally the reversal is attempted within 24 hours after the first pill is taken, but as long as a heartbeat is detected the staff will attempt the reversal. To date, four babies have been born to women who did not take the second pill but whose reversal treatment did not begin until 70 hours after the first pill. That time frame is at the outer limits of the effects of RU 486. “Effectively” is the view of the abortion industry. A chemical abortion brings in up to $800. But the industry’s resistance to reversal is more than financial. On March 30, 2015, Arizona Governor Doug Ducey signed the nation’s first law requiring physicians to tell women a chemical abortion may be reversible if they act quickly enough. Pro-abortionists predictably took to the Internet and airwaves to ridicule the statute. During an April 1 Byline broadcast on National Public Radio (NPR), Dr. Delgado reported that the reversal protocol to that time had delivered 87 healthy babies, with 75 other women maintaining their pregnancies. He made no claim that reversal succeeds in 100 percent of cases; in fact he noted a success rate of about 60 percent. Yet Dr. Stephen Chasen, an obstetrician-gynecologist whose comments also were included in the broadcast, said the process hasn’t been proven because there have been no clinical trials and Dr. Delgado had published only one paper. The NPR host opined that the results were suspect because no women treated by Dr. Delgado had taken the second drug.5 The criticism is a classic non sequitur; since the function of the second drug is to induce labor, a woman who changes her mind after taking the first drug would not take it. Four women who did change their minds after taking misoprostol, the second drug, did deliver successfully, but Dr. Delgado makes no claim that the protocol has any effect on misoprostol. The protocol specifically addresses only RU 486, and doctors who join the registry can refuse the protocol to women who have already taken misoprostol. If “all” a woman has to do is stop the pills, how does RU 486 achieve such proven success? One also has to wonder, if there is not “much demand,” why Arizona’s law generated such protests. A woman who does not wish to change her mind is not harmed by hearing about reversal. For a woman who does have second thoughts, however, the information is potentially life-saving. If the abortion industry truly believed in the sanctity of choice—if not life—then pro-abortionists ought to champion any information that gives women every choice, including a second-chance choice like Becky’s. Instead, when Planned Parenthood called to see why Becky hadn’t returned for an ultrasound to be sure the “fetus” was gone, they tried to scare her. Reversal was risky, she was told. Her baby could be deformed. Fortunately, the staff at Culture of Life Family Services had prepared her for these tactics. According to ACOG, there is no evidence that RU 486 causes birth defects. Misoprostol, however, is known to cause birth defects, at a rate of 4 to 12 percent; by comparison, the rate among the general population of babies born in the US is 3 percent. Among reversal births to date, one baby was born missing a toe on each foot; however, that mother’s first pill was not RU 486 but methotrexate, which is known to cause birth defects. Another baby was born with a port wine stain birthmark, which in the general population occurs about once in every 300 births. Becky’s son Zechariah was born October 20, 2013, beautiful and perfect. Becky is in her third year of college and employed. She and her boys still live with her parents, and although she and her husband did divorce, he remains close to his sons. Life is hectic but happily so. What the abortion industry does not want women to know, Becky tells them: light can shine in the darkest places, abortion isn’t the only option, and for some who do choose that option, a second chance is possible. 1 http://www.plannedparenthood.org/learn/abortion/the-abortion-pill. Accessed April 22, 2015. 3 http://www.guttmacher.org/pubs/fb_induced_abortion.html. Accessed April 22, 2015. 4 http://www.acog.org/Resources-And-Publications/Practice-Bulletins/Committee-on-Practice-Bulletins-Gynecology/Medical-Management-of-First-Trimester-Abortion. Accessed April 22, 2015. This entry was posted in Abortifacients, Abortion by Sherry Pinson. Bookmark the permalink.